SphereWMS got its start back in 1993 as a software development company that operated under the traditional license and professional services model. Fast forward to 2001, and SphereWMS realized a growing need for mid-size to enterprise business solutions for third party logistics (3PL) providers. Smaller-sized 3PL operations are highly sensitive to the costs associated with implementing traditional warehouse management software, especially the initial licensing fees. SphereWMS reacted to this need by switching to a web-based model for warehouse management software. Their solution still offers all the benefits of traditional software, but without the expensive consulting fees, software installation, and lengthy implementation. Instead, 3PLs can manage their entire warehouse with SphereWMS’s web-based solution—anywhere and anytime. SphereWMS has helped over 300 3PLs find a simpler way to manage their warehouse intricacies. SphereWMS: SphereWMS is designed with the specific needs of 3PLs in mind. It integrates the receiving and put-away process in the most efficient way possible, featuring advance receipt notice (ARN) handling with file upload and a web-based supplier advance ship notice (ASN) entry. Its inventory management tools provide you with the real-time information needed to track the quantity, location, status, and history of all your inventory items. SphereWMS delivers the critical information you need to make strategic business decisions with confidence. The software is even available on a mobile app, which provides mobile scanning capabilities via Wi-Fi connected devices. SphereWMS is fully integrated with UPS, FedEx, and Stamps.com for USPS, so all of your shipment information can be kept within your WMS. It also offers Electronic Data Interchange (EDI), so that you can seamlessly manage your business-to-business operations without manually tracking data. Instead, you’ll be about to connect your warehouse management system directly to your customers’. These features make the many complexities of logistics simpler and easier to manage. SphereWMS values the benefits that VARs can provide. Resellers that can provide insight at a local, national or international level are always a welcomed part of the SphereWMS enterprise. 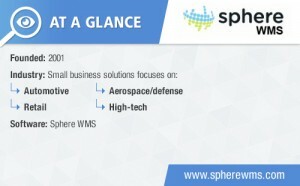 SphereWMS is actively seeking resellers who can differentiate their business, create end-user value for specific industries, and gain a competitive edge while maximizing profit. If you are interested in becoming a reseller, contact SphereWMS at info@spherewms.com or 1-214-382-2680.